20130818 - Up SORE from the climbing and put our photos on the TV for the family to see. Lilly has fleas... L trimmed her, poor dog. J&I tried to help G learn how to ride his bike. D finally got up so we cleaned out the car. Then we all loaded up, picked up lunch at Subway and went to Hanna park for picnic, playground , baseball and fishing. No luck there so we headed to another park with a quick stop to get more flea stuff for Lilly. We got to Woodside Green Park and the fishing was much better. 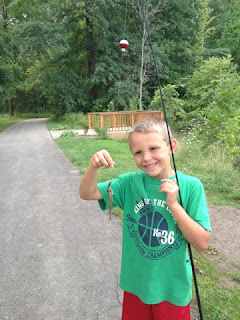 G caught his first fish!!!! The boys played, not listening, think they are nervous about school tomorrow... Back in the car and dinner at DQ. Home and getting ready for tomorrow. Up late posing things on ebay.